Crunchy on the outside yet chewy and marshmallowy on the inside, pavlova is the egg white dessert that dreams are made of. Don’t let the meringue aspect of this fancy-looking treat scare you away – it is easier to make than it may seem. Purportedly named after a Russian ballerina, pavlova, an icon of Australian and New Zealand cuisine, is an airy grand jeté of sweetness that pairs perfectly with a classic pas de deux of whipped cream and ripe in-season fruit. Since this dessert is made primarily with eggs, it is important to start with the best ones you can get. They should be as fresh as possible and free from cracks. Take the eggs out of the refrigerator one to two hours before getting started. Although it is feasible to work cold egg whites into a meringue, room temperature eggs tend to whip up much more easily. When making meringue, it is important that no fat comes in contact with the eggs whites as it will affect their ability to whip consistently. Start with clean equipment that is free from fat or grease that may be left over from past baking adventures. It is equally important to keep even the smallest amount of yolk from getting broken into the whites. When separating the eggs, break each one individually over a small bowl before adding to the larger bowl you intend to whip them in. If a yolk happens to break in the process, this allows for only the affected egg to be tossed, instead of ruining the rest of the whites already separated. Sweet and floral in taste and fragrance, mirabelle plums are the most darling little yellow fruits to eat and to look at. Feel free to substitute the more common Italian prune plums if required. Choose firm but ripe plums for this recipe as they will tend to hold their shape better when baking. Place a rack in the middle of the oven and preheat to 350 F.
Trace a rough 25-centimetre circle using a pen or pencil on a piece of parchment paper. Place the parchment circle-side down on a baking sheet. You should still be able to see the circle through the paper. Beat the egg whites and cornstarch together in a stand mixer on low speed, gradually increasing to medium speed until light and fluffy soft peaks form. The whisk attachment should leave traces in the whipped whites. Gradually increasing the speed to high, add the sugar one tablespoon at a time. Allow a couple of seconds between each addition in order for the sugar to become fully incorporated. Once all sugar has been added, continue to whip on high for 1-2 minutes. The result should be stiff and shiny peaks. When done correctly, the meringue should sit firmly in the whisk attachment when lifted from the bowl. Sprinkle the surface of the meringue with the apple cider vinegar and vanilla extract. Stir on low speed for 30 seconds to incorporate. Using a spatula, pile the meringue into the centre of the parchment circle. Spread the pavlova from the centre out so that is fills the circle. No worries if it isn’t perfectly round. Smooth the sides if desired or leave soft and natural if you prefer. 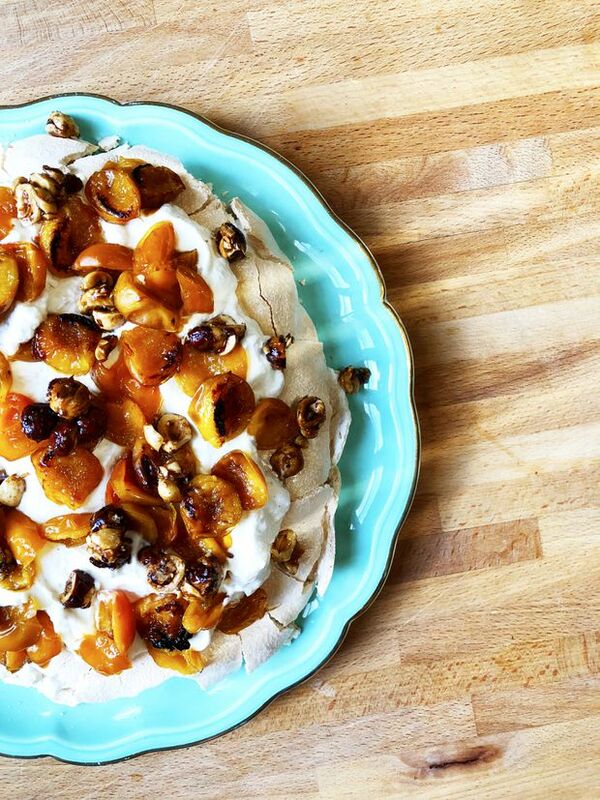 Place the pavlova in the oven and turn the temperature down to 250 F. Bake for 50-60 minutes. Once baked, turn the oven off and allow the pavlova to cool in the oven with the door cracked open for at least 1 hour. Roast the nuts at 350 F for 8-10 minutes or until well toasted. Remove from oven and chop the nuts very coarsely. Toss with the honey to coat. Continue to bake for 3 minutes more. Remove from oven and sprinkle with the salt and lime zest. Stir frequently in the baking tray until cooled. Can be made 2 days in advance and kept in a tightly sealed jar at room temperature. Preheat oven on broil. Mix the plums with the sugar and lime juice and place cut-side up on a baking sheet. Sprinkle with salt. Allow to marinate for 30 minutes. Broil the plums for 5 minutes or until caramelized. They should be cooked, but not falling apart. Place the cream in bowl of stand mixer and add sugar, cinnamon and vanilla extract. Whip on medium speed until thickened but still soft and luscious. Best if made the day of. Put the pavlova on a serving plate. Pile the cinnamon whipped cream on to the meringue. Top with the broiled plums and garnish with the honey roasted nuts. Serve within a half hour of garnishing, as the cream and fruit will start to soften the pavlova. Otherwise keep all separate until just before serving.